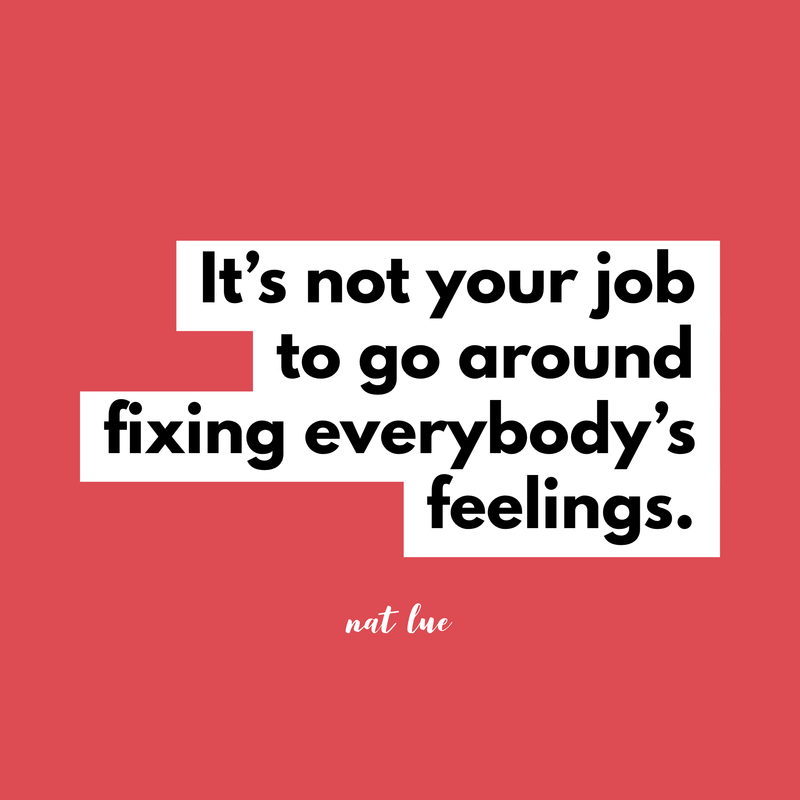 When someone has an issue, there can sometimes be this expectation that we must fix their feelings about it, even when it becomes apparent that we’re not at fault or we’re not the person that they need to address the situation with. 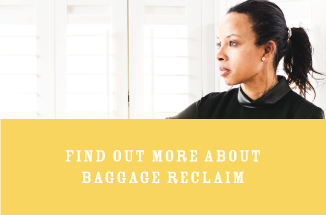 On this week’s episode of The Baggage Reclaim Sessions, I use a recent experience of this to highlight the importance of being self-aware and drawing our line when we need to. Turns out, we are not duty-bound to hold ourselves hostage to any conversation. Yes, even with family. I explain how one hour into shopping, I paused and acknowledged that I was angry and indignant. As soon as I became mindfully aware of my feelings, they subsided. Without that awareness, I might have dealt with the situation altogether differently. The anger would have expressed itself through passive aggression. We don’t have to pretend that, for example, that isn’t someone who’s The Favourite. No, we don’t have to take up residence in this recognition and persecute ourselves about it, but we cultivate a sense of humour about what might be the absurdity of the situation when we recognise, for instance, that a sibling is The Golden Child, The Prodigal Son/Daughter etc. With misunderstandings, sometimes the things that people say to and about you raise alarm bells. You become aware of their distrust, their insecurities. Maybe some issues that they’ve hoarded. You realise that perhaps you’re not quite as cool as you thought you both were. It’s not your job to be the listener, the fixer, the perfect one, the peacekeeper, the scapegoat, the black sheep. Consider the things that you believe are in your job description. It’s my job to do this in my family. It’s my job to do this as a person. Those things are not your job. These are things that over time, you’ve told yourself they’re what you need to be and do in order to feel worthy and needed. Anything that’s causing you to disrespect who you are as a person, to invalidate your needs, expectations, desires, feelings and opinions, that’s not cool. And it’s not your job. Sometimes people want to be angry. Sometimes we don’t want to move on from stuff. People don’t feel about things based on how things are. People feel about things based on what they believe including what they want to believe. 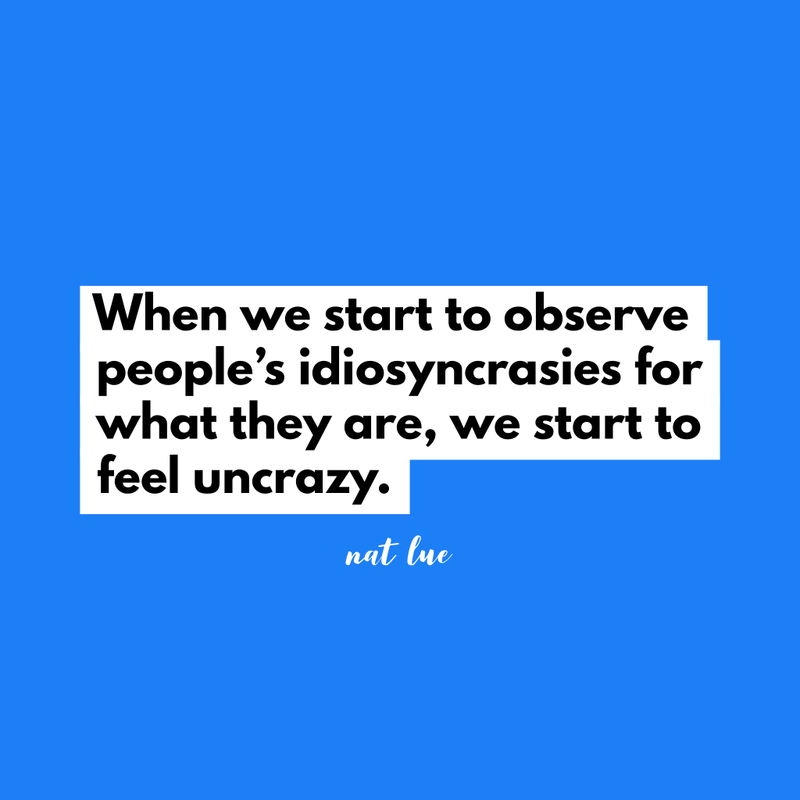 When we start to observe people’s idiosyncrasies for what they are, we start to feel “uncrazy”. “I’m sorry to hear that you’re going through that. I really hope you get it sorted out soon” and similar, detach us from the advisory role that they might expect but that isn’t necessarily our place (or desire) to fulfil. Questions like “What do you want me to do?” and “What do I want them to do?” bring clarity to these situations. These pave the way to a clearer ask, recognising what you need to do for you, or recognising that you have unrealistic expectations. It’s also very possible they/you have it already. Each time we become more aware of who we are and we become more aware of what we’re carrying around with us in terms of emotional baggage, we have an opportunity to heal, grow and learn. By responding even a little differently to how we have in the past, we evolve. Loved this podcast Natalie and found it really relevant to my week. I have a lady who reports to me at work who although she is a nice person, has a LOT of issues in her personal life. Every Monday morning she loves to come into work, find me and spend 10 minutes dumping all of the dramas that have happened to her over the weekend onto me. It had got to the point where I would see her coming in and my heart would sink. A couple of weeks ago I was busy and unable to give her my immediate attention so she actually followed me around my workplace for 5 minutes talking at my back as I was trying to fix the work printer. I did at that point tell her to go away ( in a less polite form). She was upset and when things had calmed down, I took her to one side for a chat. It turns out that she genuinely believed that part of my role and responsibility as her line manager was to listen and counsel her through all of the personal problems that were happening outside work. My work does provide support for people that need counselling and emotional support so I gave her the details. We have been working so much better together since we had that conversation and I don’t dread Mondays any more! I wish I’d got more in touch with my emotions before I told her to F off but life is a learning curve! Hi Claire. Sometimes you need the experience of being pushed to the brink so that you’re forced to create the overdue boundary by speaking and stepping up. You’re only human and weeks of biting your tongue and listening had tipped you over the edge. The next time you are in a situation where you’re forcing yourself to grin and bear it, you will remember this one! I’m glad that she’s getting the support she needs. Interesting. I have a friend who has dumping so much on me for a while now – she is constantly panicked about something and sending these frantic messages. I’ve tried to be there for her and give advice, but it’s getting exhausting. In between crises, she seems to want to message constantly and it often feels kind of forced, instead of just letting the communication happen naturally when there is something to chat about. I don’t want to be mean, but I also need a break. What is a good way to redirect this? Phone on ‘do not disturb’ (or similar) after 9pm. Start setting some boundaries for yourself about when you’re using your phone. Instead of reading messages over the course of the day, do it at intervals so that being chained to your phone isn’t just specifically about her. And remember: from her side of things, she thinks that there is something to chat about. I have a couple of women friends with troubling family relationships. I suppose because I’m one who is there for others, they dump their family s$&@ on occasion. Most of what is going on would be somewhat solvable with a hard talk to the family member. While sometimes I feel sad for not having living family, times like those make me grateful to be rid of the stupid and unnecessary drama. Reminds me of my own family and my dad’s wives who’d dump on me about my dad’s behavior starting from my early childhood. At 16, I told a then stepmother that the family was a disaster and to get a divorce. Thought I’d be beaten but she looked at me with shock and by the following year the family was broken up, she divorced my dad, and I bailed from family life for good. Sometimes drastic measures are needed, eh? I see so many posts, including here, on family dysfunction and drama and really must wonder if the modern nuclear family unit is inherently dysfunctional.